Metaphysical Musings | There's much more out there than what we see in the physical world. How do I book a reading!? There's much more out there than what we see in the physical world. You may be wondering what types of readings I offer and what they look like. I thought I’d just put up a quick post to sort of explain the work I do. This is the most common type of reading I do as most of my clients are local. You would set an appointment and come to my house. I have two chairs set up and a table with a candle, some stones and decks of cards. Before you come, about a half hour prior to your reading, I get myself into a relaxed state and begin to channel the messages that are coming in for you. I write these down and this is what I usually use as a “launch point” for my readings. We start the reading there and then it evolves in the way it is meant. Usually at the end, I have my clients pull cards from an oracle deck just to confirm the messages that I have passed on. Wait a sec, don’t I have to be in the same room as you in order for you to read my energy? That’s the beauty of energy, my friends. I can do this work from anywhere and have actually done some fairly awesome readings by phone for clients all across the country. These readings work generally the same way where I would channel information prior to your call and would jot down any notes or observations in my notebook. Then I call you and the reading proceeds in much the same way as my regular in person readings. The only difference is that I don’t always pull cards in the end of my phone readings since I like the client to pull the cards and confirm the messages. I think that way is much more personal to the client than having me draw the cards. If you have a group of friends who are interested in a party, I will come to your location and do the readings. The minimum number of people for a party is four. The maximum is ten. At a party, I need a separate room to work in and I read party guests one at a time. The difference with party readings is that they are typically shorter twenty to thirty minute sessions so I can get through all of the readings in a reasonable amount of time. The readings at a party are a little different. Normally I will have guests shuffle a deck of oracle cards and draw three. It gives me a chance to ground my energy and connect to the client sitting across from me. I launch the readings here and they evolve as they are meant to. This is a fun way to change up your usual girls night in! At a psychic fair, there are typically a room full of readers. There are different kinds of readings available and you will be sitting in a large room. The readings aren’t really private so just be aware before you book an appointment just in case you aren’t okay with that. I have a table at these events and you will be brought in at the time of your appointment. At fairs I start my readings the same way as parties with oracle cards again in order to connect with each new client and to ground my energy. 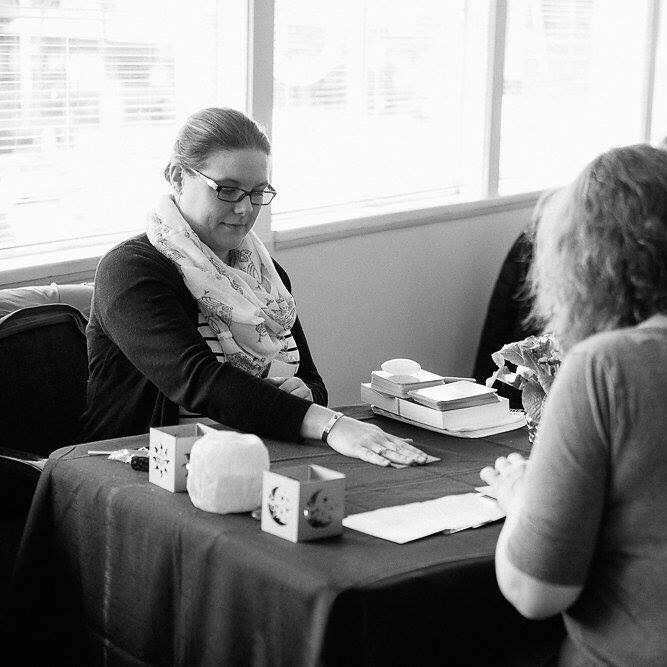 The nice thing about psychic fairs is that the sessions are shorter and more cost effective if you are just looking to try it out, or try a variety of readers. there are also usually healers and vendors as well! Whatever type of reading you choose, come in with an open mindand an open heart. Come in with the understanding that I am here to give you the messages you need at this time for your highest good and I want to make sure you get all you can from your session with me. It helps you set clear intentions around the person you want to come through and jot down any questions you wish to ask in the reading. It’s easy to forget in the spur of the moment and there is usually a lot to process! You can get in touch with me via Facebook or Twitter to book a reading. Let me know if you have any questions! Why should you make time for meditation? I’m always telling my clients that they should allow themselves time to practice meditation. You do not have to be a monk on a mountaintop sitting for hours and hours waiting for enlightenment. Meditation isn’t about being enlightened or getting somewhere. If you find yourself sitting and running through the mental list of all of the things that you need to do, the exercise is not useful. You aren’t simply being, you are sitting and thinking about all the things you need to do under the guise of meditation. Does that make sense? I saw a segment on meditation on Dr. Oz one day when I was flipping through the channels on TV. I don’t really give a huge amount of attention to his talk show, but one thing that he said about meditation stuck with me. What he said was, “You should only meditate as long as you want to.” Interesting, I thought. That makes sense. Sometimes when I sit down for my nightly meditation practice I can only sit for ten minutes before my mind starts to wander and I can’t get myself into the zone. Instead of getting frustrated with yourself, get up and do something else. Allow yourself to move on from the meditation. Now isn’t the time and your mind is too occupied. Try again tomorrow or at a different time of the day. I think that meditation is individual and it depends on your own personal preference. Some people like it to be silent, some people (like me) find the silence a bit creepy (especially when I can hear the house creaking and people outside) and play some soft music. I started with guided meditations and I have a few that I really like. It depends on the time investment that you are willing to make as well. When you are selecting a guided meditation, keep in mind that you may not want to sit for an entire hour. There are some fantastic guided meditations available on YouTube and Spotify. When I’m looking for something guided, I enjoy Deepak Chopra’s The Soul of Healing Meditations, or Dudley Evenson’s Chakra Meditations and Tones (Both are available on Spotify and YouTube). Especially when I was first starting out with meditations it helped to have a guide to focus on. It also helps you get really good at moving energy through and focusing on your chakras and their different functions. I still use them now when I’m looking to chakra clear or on days when I’m not sure I have the attention span to focus on my breathing for a long period of time. When I’m not using guided meditations, one of my favourite go to artists for meditation is Snatam Kaur. She has different meditations available for different things (releasing, healing, strength etc.) I particularly like Merge and Flow. With me, the meditation music if I’m focusing on breathing has to be in a different language or just ambient music, since if it’s in English, I’ll pay too much attention to the music and words and forget my breathing. Just a personal preference! Remember, meditation is about being, not doing. You’re not trying to accomplish anything here other than reconnecting with yourself. If you are not using a guided meditation, focus on your breathing. When was the last time you took a good, deep belly breath? You want to breathe all the way down to your belly through your nose and out through your mouth. I like to breathe in for a count of eight and fill my lungs all the way up, then hold for a second and release for eight seconds. It takes a while to get to the eight second breathing intervals. You have to set the intention for your breathing to slow down. Try not to force it. As you are breathing , if your mind begins to wander, on the inhale, think the word in. On the exhale, think the word out. It seems silly, but can keep you focused on what you are doing. Nothing matters but breathing in and out. The longer you practice, the better you’ll feel. My goal is to sit in meditation for about 30 minutes each day. I find it really helps to ground and centre my energy. I feel more connected to myself, earth and source after a good meditation session. There are so many amazing reasons to meditate and I can tell you that before I started meditating, I would easily rate my stress at an 8 out of 10 on any given day. I worried about everything. I have found that meditation has really given me the sense of peace I’ve needed to find and that it helped me manage my stress and anxiety. Now I look forward to my thirty minutes per day of meditation and as soon as I walk into my room with the intention to meditate I can get into the meditation zone more quickly and easily. Just like everyone else I’ll fall asleep sometimes, or some nights I’m just not really into it and that’s okay. I don’t force the issue. Forcing meditation goes against everything meditation is. Don’t be too hard on yourself, start small. Maybe begin with five minutes and work up from there. Soon you’ll start to look forward to doing it and will miss it when you don’t. I promise! I love slipping into that place, between waking and dreaming. Nothing matters now but the breath moving in and out of my body, the oxygen nourishing my blood and organs. I always think I’ve made it when I enter that space of conscious quiet. There are no pressing demands, there are no worries about things I must do, there are no worries about things I must fear, there is only the present, the here and now. Taking the time to be still and quiet is hugely important to my work as a medium and it’s great for my well-being. I’m able to project myself to wherever I want to be. Today, I was on a mountain top, looking out upon a sunset and the ocean crashing below. A gentle breeze was swirling around me. This gave way to a beach with crashing waves and palm trees waving in the breeze. Then it all turned into fragments of light and an illuminated doorway, which kept eluding me as I walked toward it. You can go anywhere you want in meditation. Just put your mind there and there you are. Sometimes, I go to familiar places like my parents living room. Other times I head far away. I always come back refreshed and rejuvenated. Any fear, stress or anxiety I’m holding onto from my day is gone. When I return, it is just me and the here and now. If you are working on development of your intuition, meditation is a great place to start. 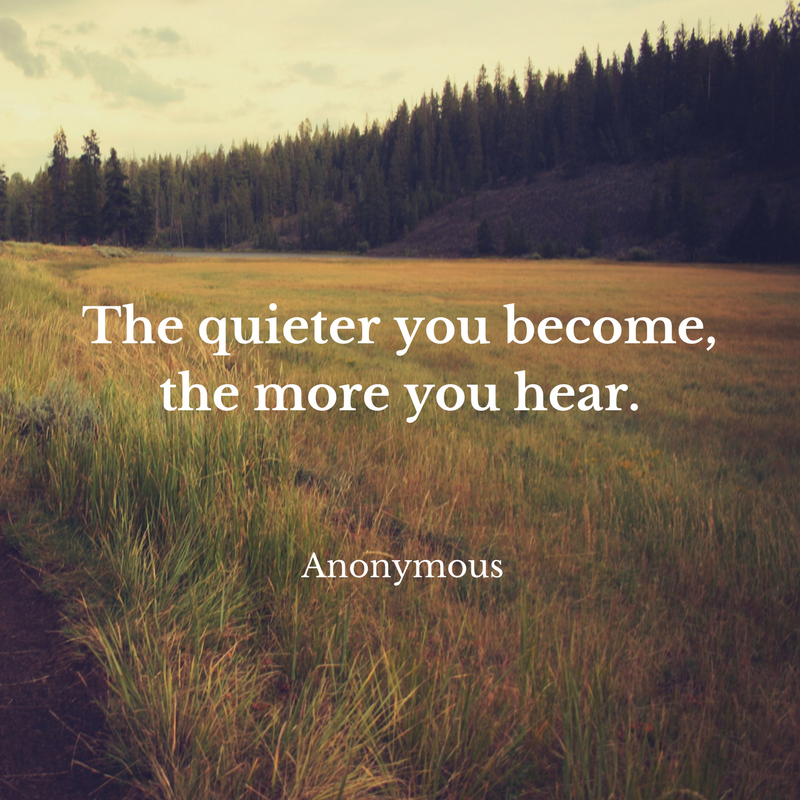 Once you learn to quiet all of the clatter going on in the physical, you can download messages from the non-physical much more easily. You will be able to distinguish the voice. Even if you’re not working on intuition or spirit communication, meditation has tons of wonderful effects on your body and your state of mind. You don’t need to sit for hours either. Start with five minutes and work yourself up to about half an hour. Once you make it a habit, you’ll look forward to it every day. I had a strange yet interesting dream last night. I think that we do a lot of soul work while we are asleep since we are able to leave our slumbering bodies in bed. Last night I dreamed that I was in some kind of hospital, which didn’t really look like your conventional hospital. It was white and sterile and I was lying on a table and the doctors were operating on my throat chakra. After the surgery was over, in the dream, I was coughing up blood while I was in recovery. I think this means that I was letting go of something or that something was removed from my throat chakra. Probably some kind of pesky blockage. After the blood came up, the doctors inflated my throat chakra with a balloon to reopen it and make it larger. The throat chakra is associated with communication, hearing, listening and speaking the truth as it is. It’s also a centre of self expression and decision making. It is the centre of purification, and can also help us get in touch with feelings that have been suppressed or forgotten about. In thinking about it now, I walked into the metaphysical shop yesterday and the person behind the counter greeted me by name. I guess my photo and word about me is getting out. I thought it was cool and was chatting about readings and whatnot. I think I’ve finally reached the point where I really feel that it’s okay to be me. It’s okay to be public with my mediumship ability and the power it has to help and heal others, and above all else, the fact that I’m not crazy. Something was removed from my throat chakra last night and I think it will result in progress. 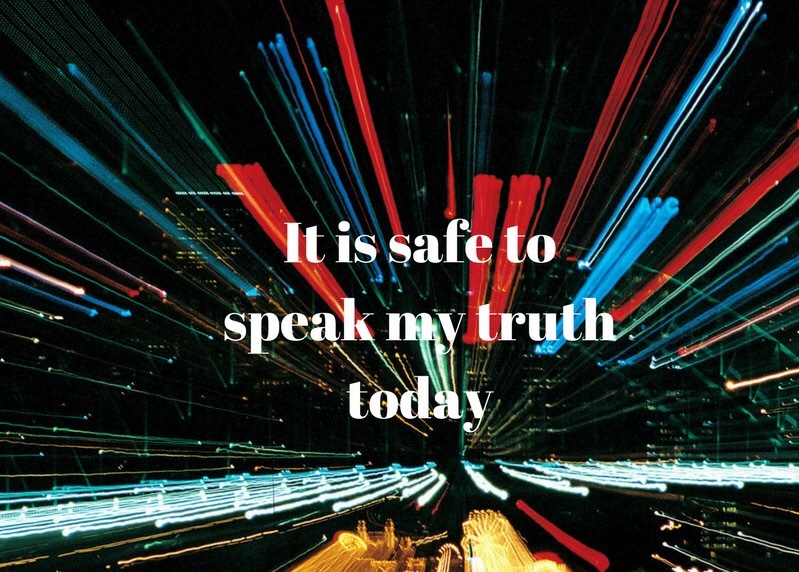 I’m ready to speak my truth. Tonight I was thinking about society and our desire to do and have what the media and outside influences tell us we should do or have. We all want to be accepted by our peers. I think it is kind of sad that we have gotten to the point where retailers and the media can tell us what will make us col and acceptable. I mean, I guess societal norms have always determined social acceptance, but what happened to diversity? I can’t imagine living my life as anyone else or in any way other than the way I am currently living it. It was scary to come out of the closet and become a practicing medium, but now that I am fully out of the psychic closet, I’m not looking back. The world is so much more vibrant and I feel better in my own skin. Everyone is on their own journey and is fighting battles we know nothing about which is why kindness and compassion should always be our approach. Life is not a contest. We are not here to be in direct competition with each other, we are here to help one another and make each other stronger. I don’t understand the incessant need we seem to have to measure ourselves against others. What someone has or how successful or spiritual they are has nothing to do with your journey. They are not your gatepost or measuring stick. Keep your eyes on your own journey, or you could miss some awesome stuff along the way. Help and nurture others as much as you can out of kindness and remember, they are on their own journey and will find their own way, just as you will. Assist and trust and we will all be fine. Remember to have faith in the universe and to know that where you are is where you are meant to be. Do that which inspires and fulfills you. That will keep you on the path to manifesting all your heart’s desires. Before every reading, I say a quick prayer and set a quick intention asking that I will be able to provide you with what you need for the greatest good at this time. I ask for messages which deliver the greatest level of comfort, closure, clarity and guidance you need at this time. I ask that the messages received be clear and understandable. I ask Archangel Azrael to help me to be an effective channel between this world and the next and assist in facilitating communication between my clients and their loved ones through me. While I’m not here to meet your expectations, or convince you whether or not mediumship is true or real, I am charged with the duty of delivering the messages you need from other realms. A lot of clients come to me and ask me about the future. They want to know what their children will do for a living, etc. Being a medium, my specialty is to tell you any messages that come across from people you know that are on the other side. While I will answer your questions about what might come to pass in the future, it’s always with the disclaimer that life is based on decisions. Your children (and you) are going to make a lot of decisions between now and the future. I can read the energy as it stands now, but the reading I give you today will likely be different than a reading I give you six months from now because things can change rapidly. When I channel and bring in the information, I ask for guidance and messages that are required at the present moment. I pull in what you are going through now and what you need to know to get through it. I pull in any persistent messaging from spirit and pass it on. A fortune teller and a medium are pretty different things, and part of life should be a mystery. Sometimes the information that you want is not information you are meant to have at this time, so if you go to a medium and you can’t get answers to the questions you’re worried about, rest calmly in the faith that this is information you’re not meant to have at this time. The answers will be made clear at the perfect time for you to receive them. The future is constantly changing and evolving, look forward with excited anticipation to see what it brings!